Being that this is Christmas, I’m going to share my list of comic book villains that I wish would appear on some of the television series currently airing. 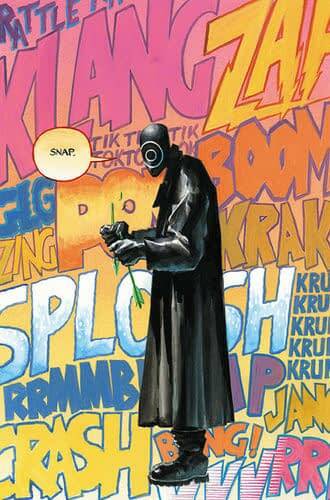 Now we take a look at Arrow and going to go with what may be his most requested villain, Onomatopoeia. Created by Kevin Smith and Phil Hester in their year-long run on the character, first appearing in Green Arrow vol 3 #12 (2002). He is a serial killer that targets non-powered, vigilante heroes… like most of Team Arrow. He got his name because he imitates the noises around him like gun shots or a dripping faucet. He carries two automatic handguns and wears a mask that completely obscures his face. He appears to be a highly trained fighter, both with guns and an army knife he always carries. He came in contact with Oliver Queen when the killer went after Connor Hawke, the second Green Arrow. He severely injured Connor and was in surgery when Onomatopoeia returned to finish the job and it took both Green Arrow and Black Canary to stop him. He has appeared during Infinite Crisis, helped Joker escape to lure out Batman, and has gone after Deadshot. He’s profiled in the DC comic universe continues to grow. I think he would be a good two-part villain to come into a season, maybe hired by the big bad, to eliminated Green Arrow or Wild Dog, etc. I think the only speaking in sounds and the mask with the concentric circles would make him a very interesting and creepy character that could really shake up the team with him being after one specifically. He’s exactly the type of villain that would thrive on the show.